"On March 6, 2017 the Russian Federation transferred the amount of 77 888 309 U.S. dollars to the United Nations account as payment of Russia’s assessed contribution to United Nations regular budget." Russia has made its annual payment to the UN budget, the country’s Permanent Mission to the United Nations said in a statement. "On March 6, 2017 the Russian Federation transferred the amount of 77 888 309 U.S. dollars to the United Nations account as payment of Russia’s assessed contribution to United Nations regular budget," the statement reads. The United Nations budget for the 2016-2017 biennium is $5.4 billion, each country’s contribution is calculated based on its 10-year GDP rate, per capita income and foreign debt. The United States remains the main contributor with a share of 22 percent while Russia contributes around 2.5 percent. According to the United Nations’ official website, more than 50 countries have already made their payments for 2017. China has contributed the largest amount of nearly $200 million while Djibouti, the Marshall Islands and the Solomon Islands have each contributed only $25,000. 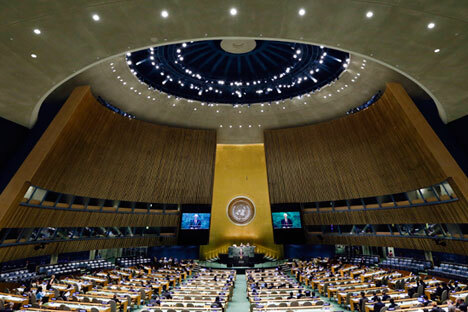 If a country does not make the necessary contributions to the UN budged for two years, then its right to vote in the United Nations General Assembly is suspended. In February, Venezuela, Libya, Sudan as well as Papua New Guinea, Vanuatu and Cabo Verde temporarily lost their General Assembly votes for failing to pay their dues.